Growing Green: “THE POPE IS JUST A MAN.” Yes, but. . . . Pope Francis in America. United States Congress. United Nations. Care for the Planet. Nuclear Weapons. World Trade Center Memorial. “THE POPE IS JUST A MAN.” Yes, but. . . . Pope Francis in America. United States Congress. United Nations. Care for the Planet. Nuclear Weapons. World Trade Center Memorial. Yes, the Pope is a human, but of a special sort. He’s a Christian ethicist. Forget papal authority for the moment. Think of his authority as that of a person of faith who’s thought very carefully about faith and human life. Since I’m a Christian ethicist myself, I hope to interpret to you what Pope Francis has said and done in the U.S. The fundamental pronouncement of his visit in my opinion concerns our obligation to care for the planet. A couple of months ago he released a teaching document sub-titled: On care for our common home. The encyclical links Science and faith as partners in saving the planet. It's not just one or the other. Personally, I'd prefer to go further and state that anyone of honesty and good will can contribute to a hopeful future for the planet. In the U.S., the Pope also spoke of care for the family. No ethicist would disagree in regard to the need to care for the family, without specifying what form a human family must take. Mutual love, and respect are key enduring attributes that create a viable family. The Pope called for the prohibition of nuclear weapons. This plea goes far beyond the Iran treaty. Strange that the treaty has so many politicians in fits of anger. The treaty is just a start, but at least it’s a beginning and deserves support. Today,September 25, 2015, the Pope spoke at a ceremony of remembrance at the Trade Center memorial in New York City. Personally, I have a strong link with the now-trashed New York Trade Center. Here’s a photo of my pass to the Trade Center. I was a member of NYSSA (New York Center of Security Analysts), which was located on the 40th floor. 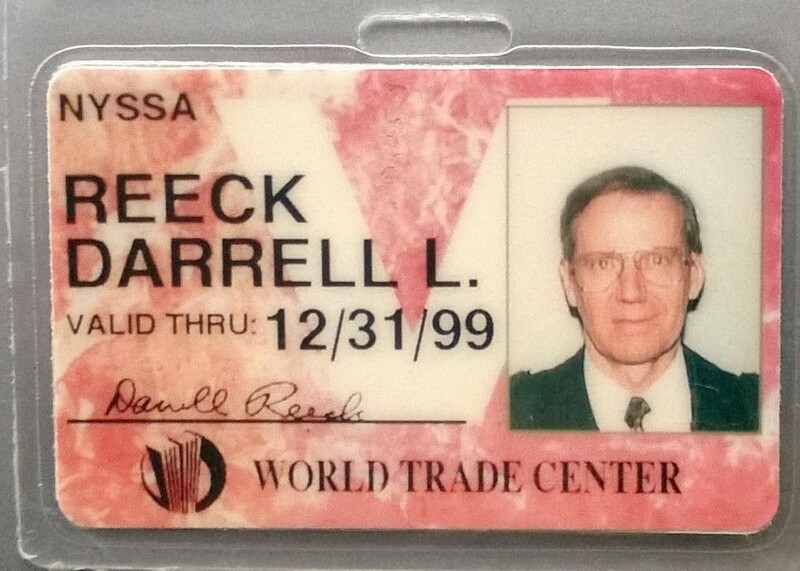 I've kept my pass as a treasured reminder piece, especially since 9/11. Young people, radiating hope and commitment. Will their hope and confidence be rewarded over their lifetimes? After the song the Pope asked all to share signs of peace with each other. Lucy and I, watching on TV, shared the sign of peace. Will you join in sharing peace as you go forward? Final phrases about the Pope. Not overtly political. Humble. Uses gestures, not just words. A human model of how to link faith and life. P.S. a special excitement for me: no Christian ethicist has spoken so publicly since Dr. Martin Luther King. And no one at all has spoken in such a meaningful way to the U.N. since former Secretary General Dag Hammarskjold. Thank you for reading this. Share the Pope's message.